Son of Nathaniel and grandson of Aḳbun, the high priests; a prominent leader and high priest of the Samaritans in the time of the emperor Constantine (fourth century). According to Samaritan traditions (see Neubauer, "Chronique Samaritaine," pp. 19-56, Paris, 1873; Abu al-Fatḥ, "Annales Samaritani," ed. Wilmar, pp. 13-132), he during his forty years' rule restored the pure worship on Mount Gerizim after having driven off the Roman guard and destroyed the Roman eagle set up there. He reestablished schools for the study of the Law, and reorganized the priesthood, appointing twelve priests over an equal number of districts. The last chapter of the "Samaritan Chronicle," known under the name of the "Book of Joshua," contains in fragmentary form a legendary story of Baba, according to which the Samaritans, during the time of the Roman persecution, in order to escape the death penalty for practising circumcision, used to carry their children in baskets covered with wool into a cave, where, by the light of candles, the rite was performed (compare Yer. Ket. i. 4, 25c; less correctly Sanh. 32b, ). When the time came for Baba to be circumcised, his father had him also carried in the same manner to the cave by his maid-servant. German(us), the Roman (bishop), who was stationed at the gate of Nathaniel's house, knew what was intended, but allowed the maid to pass in order that the child might be circumcised in defiance of the imperial edict. Thenceforth it became customary at every Samaritan circumcision to recall the name of German, the Roman. When Baba became high priest he sent his nephew, named Levi, to Constantinople to study. When the latter, under the guise of a Christian, had been elevated to the rank of a Christian archbishop, he obtained permission to return to Nablus, Baba's city, and visit there the church reared on Mount Gerizim in place of the ancient Samaritan temple. 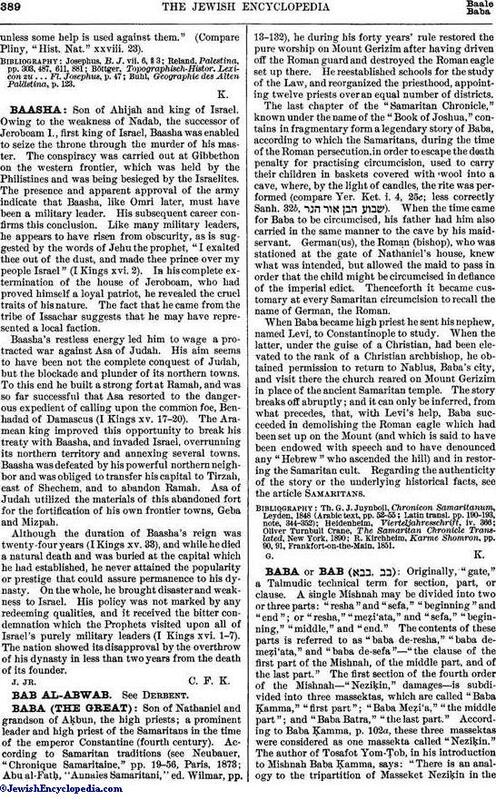 The story breaks off abruptly; and it can only be inferred, from what precedes, that, with Levi's help, Baba succeeded in demolishing the Roman eagle which had been set up on the Mount (and which is said to have been endowed with speech and to have denounced any "Hebrew" who ascended the hill) and in restoring the Samaritan cult. Regarding the authenticity of the story or the underlying historical facts, see the article Samaritans. R. Kirchheim, Karme Shomron, pp. 90, 91, Frankfort-on-the-Main, 1851.